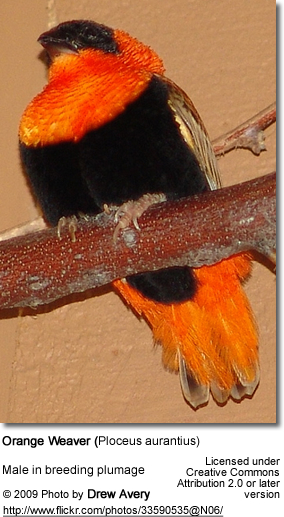 The Orange Weaver Finches (Ploceus aurantius) are small African birds that were named for their bright orange plumage details as well as the males' custom of constructing complexly woven nests. Their large range stretches from Sierra Leone in the west of Africa down the Atlantic Coast to the country of Angola and east across central Africa to the countries of Kenya and Tanzania. They inhabit grasslands, farm land and forests. They are common within their range, where these social birds are usually seen in flocks, often with other finch species. They are also popular in aviculture. Range: Southeastern Sierra Leone east along coast (including some offshore islets) to southeastern Ghana, Togo and southern Nigeria, and south to western and southern Cameroon, Equatorial Guinea, Gabon (where they are found along the coast and in the Ivindo Basin), west to the Central African Republic and the People's Republic of the Congo (mainly coast and the Congo river region), as well as along the coast and rivers in the Democratic Republic of the Congo and coastal northern Angola. Range: Southern Uganda, extreme western Kenya and northwestern Tanzania, where they are found in the Lake Victoria basin. Orange Weavers measure about 5 inches (12.5 cm) in length, including the tail. Males and females have different plumage details, and seasonal differences also exist in the males. The breeding males of the Northern Red Bishop can be identified by their red throats, and the black patch extending further back on the crown and below the bill, and their long tail-coverts which almost cover the entire tail..The Black-winged Red Bishop or Crimson-crowned Weaver is black below the bill and red above the bill. In the wild, Orange Weavers mostly feed on grass seeds, some insects (particularly when breeding), and various green foods. Probably some berries. Captive birds usually receive a diet that includes a balanced mixture of small cereal seeds, fresh greens and some live foods (often mealworms). Orange Weavers don't form close pair bonds and one male usually services up to three females. They generally nest close to water in reed beds and are often in company with other finches. A clutch usually consists of 3 - 5 eggs, which are incubated for 12 - 14 days to hatching. These gregarious, active and hardy birds usually do well in a mixed colony in spacious flights. They can usually kept with larger finches. Generally friendly, some of them may get aggressive when breeding and need to be separated from the group at that time. Males construct intrinsically woven nests during the breeding season to which he attracts suitable females. Most of them live about 7 years. Well-cared captive birds can reach 10 or more years.